48.9% of users who are registered voters said they will definitely vote for Romney, compared to 46.1% who will vote for Obama. Interpreted by electoral votes, this is 290 votes for Romney and 230 for Obama. As to who they think will actually win the election, however, 47.6% think Obama compared to 39.6% in Romney’s favor. 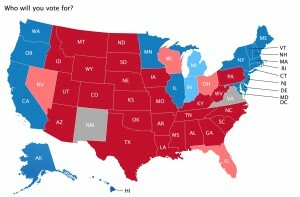 Interpreted electorally, this gives 349 to Obama and only 189 to Romney. New Mexico and Virginia are dead heats—46.9% for each candidate in New Mexico and 47.6% in Virginia. The other tightly contested states in the survey are Florida with 49.2% for Romney and 47.5% for Obama; Ohio with 48.8% for Romney and 46.3% for Obama; and New Hampshire with 48.2% for Obama and 45.3% for Romney. Of course, this has nothing to do with security, we don’t mix politics with business, and we have not taken any position on the election. Furthermore, we are based in the Czech Republic so any position we took would be meaningless anyways. But still, we have a large base of users in the USA—about 11 million—and we thought it could be insightful if their collective opinion could predict the election results as well as the professional polling firms. Now, this is not a scientific sample and thus there could be many biases in the sample. But what I find most interesting is the clear difference between voting preference and opinion as to who will win. 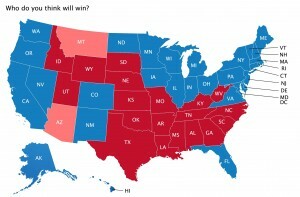 While it is evident that our users have a preference for Romney, a preference that is not reflected in most national polls, even more though believe that Obama will win. This ability to crowd source predictions has been the subject of much research and experimentation in the past few years. An article in National Defense Magazine (http://www.nationaldefensemagazine.org/archive/2011/december/pages/usgovernmentturnstocrowdsourcingforintelligence.aspx) is an excellent example. There are also some interesting insights if one looks at the voters who are not sure if they are going to vote or not. More of these prefer Obama and including their votes narrows both the Electoral College and popular vote gaps. And as you see the map below, it is obvious that some of the opinions of our users are markedly different from other polls and past results. As an example, our Alaskan users prefer Obama over Romney even though a Democrat has not won in Alaska in many, many years. Regardless of which way the election actually turns out, our Avast users will be correct. If Romney wins, the survey preference of our users is proven. If Obama wins, it shows the ability to accurately crowd source the correct result.